If the shoe fits, x-ray vision will tell you. At least, it did in Port Angeles, Washington – and other towns across North America – in the early- to mid-1900s, when any shoe store worth its salt had a contraption called the shoe-fitting fluoroscope somewhere on its sales floor. 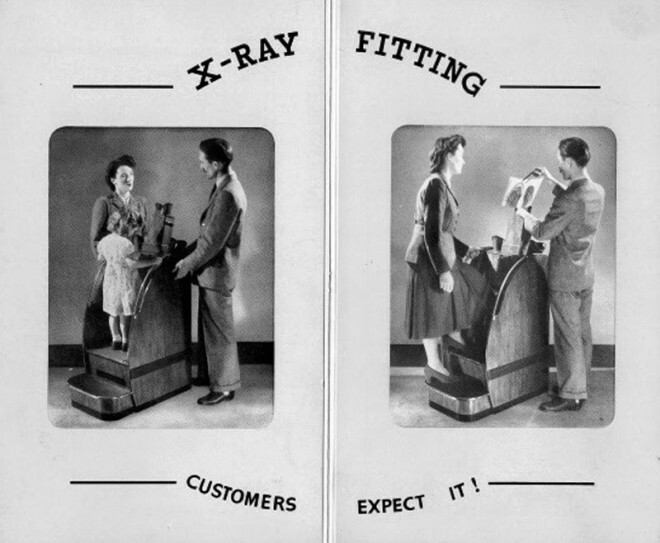 A waist-high box topped with eyepieces, the fluoroscope allowed customers and sales staff to view real-time x-ray images of customers’ feet inside their shoes – ostensibly to ensure that the shoes fit properly, with no pinching, squeezing, cramming or distorting of the toes in ways that might cause problems down the line. I encountered the fluoroscope pictured below inside the historic Family Shoe Store in downtown Port Angeles, where the owner has a large collection of antique shoe paraphernalia on public display. From the 1920s to the 1950s, fluoroscopes were the “in” thing across North America and Europe. A particular hit with parents and children, the machines made shoe shopping scientific, participatory and fun. But it’s not difficult to guess the end of this story: health concerns about radiation exposure levels eventually (and rightfully) did the fluoroscopes in. Learn more about the fluoroscope – and other items on display at Family Shoe Store – below. Invented in the latter years of World War I by a Boston-based physician looking for a way to examine the injured feet of boot-clad soldiers, the fluoroscope was in 1920 rebranded and remarketed as a tool for the retail shoe industry. A fluoroscope consists of a pedestal-like cabinet, made of wood or metal, with an open platform at the bottom. Customers stand on the platform, placing their shoe-clad feet inside the opening. (The opening in the fluoroscope pictured above is hidden behind the framed magazine clippings on the platform.) When the store clerk flicks a switch, an x-ray tube in the cabinet’s base shoots radiation up through the feet and onto a fluorescent screen near the top of the cabinet. For about 20 seconds, the customer, clerk and parent (or other interested party) can peer through the three viewing eyepieces atop the cabinet and examine, in real-time, the lay of the customer’s bones inside his or her shoes. If the foot appears contorted or constrained, everyone can see so, and another pair of shoes can be selected and tested. Fluoroscopes quickly proved their worth in the children’s market. For kids, the thrill of watching one’s bony toes wiggle around in greenish-yellow x-ray format was better than candy. For parents, the visible (and impartial) proof that their little ones’ feet were happy and healthy inside that new set of shoes was reassuring. For shoe sellers, the machine was a sales boon, drawing customers in the door and bolstering store credibility. Many shops began recommending a regular schedule of fitting exams for young customers, to ensure that sensitive little toes weren’t crunched against the ends of “outgrown” shoes. By the early 1950s, there were an estimated 10,000 shoe-fitting fluoroscopes across the United States – four in Port Angeles alone – and another 4,000 spread throughout Britain and Canada. Sounds nifty, you say, but isn’t using radiation to fit shoes a health risk? Well, yes, but in the 1920s and 1930s, when x-ray technology was new and the risks weren’t well understood or documented (particularly with regards to safe exposure levels), that wasn’t yet a concern. Folks were also riding high on a new wave of domestic mechanization: automobiles, refrigerators, televisions, washing machines, electric toasters, vacuum cleaners and other whiz-bang devices were revolutionizing home life and bringing the trusted authority of “science” into the everyday realm. By the late 1940s, however, excitement over the fluoroscope began to falter. In 1946, the American Standards Association published a safety code for the industrial use of x-rays, specifying maximum exposure levels for different parts of the body. For the feet, the recommended dose was two roetgens (R) of radiation per five seconds of exposure. But the fluoroscope regularly blasted users’ feet with higher doses than that. A 1948 study of 23 machines in Detroit found that most pumped out 16 to 75 R per minute – or 1.33 to 6.25 R per five-second exposure. Considering that some customers had more than one exam per visit, and that store clerks likely stuck their toes in the machines on a regular basis, exposure levels quickly added up. Needless to say, state governments began banning fluoroscopes as early as 1957, and by the mid-1960s, they were gone across the board – junked, donated, unplugged or relegated to museum pieces. Today, shoe sellers use common sense – and a firm squeeze of the toe box – to gauge fit. All the better for everyone’s long-term health. 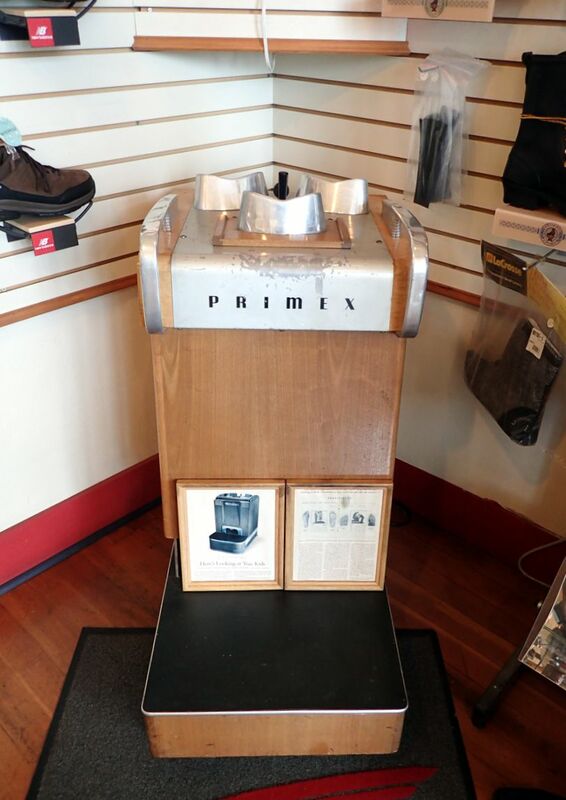 Family Shoe Store in Port Angeles decommissioned its two fluoroscopes in 1961, but the shop held on to its more modern unit – a Primex model out of Chicago – as a nod to nostalgia. The Primex is one of several pieces in shop-owner Kevin Thompson’s impressive collection of vintage shoe memorabilia, much of it focused on the popular children’s brands Red Goose and Poll-Parrot, which both competed with Buster Brown for the international market. Wander through Family Shoe Store and you’ll find shelves of antique shoes both curious and practical; interactive advertising pieces from Poll-Parrot, including a “kid-friendly” mirror, animal-themed fitting bench and mechanical wall mural; and a restored Red Goose mascot striding forth from an exterior wall (Thomspon spent over two weeks uncovering the original so it could be repainted). Indeed, it is. A museum very worthy of a visit, if for no other reason than to gaze at the shoe-fitting fluoroscope in the corner and imagine a time when x-ray vision was an attainable superpower, temporarily available to any child in the market for a new pair of shoes. Jacalyn Duffin and Charles R. R. Hayter, “Baring the Sole: The Rise and Fall of the Shoe-Fitting Fluoroscope,” Isis, Vol. 91, No. 2 (June 2000), pp. 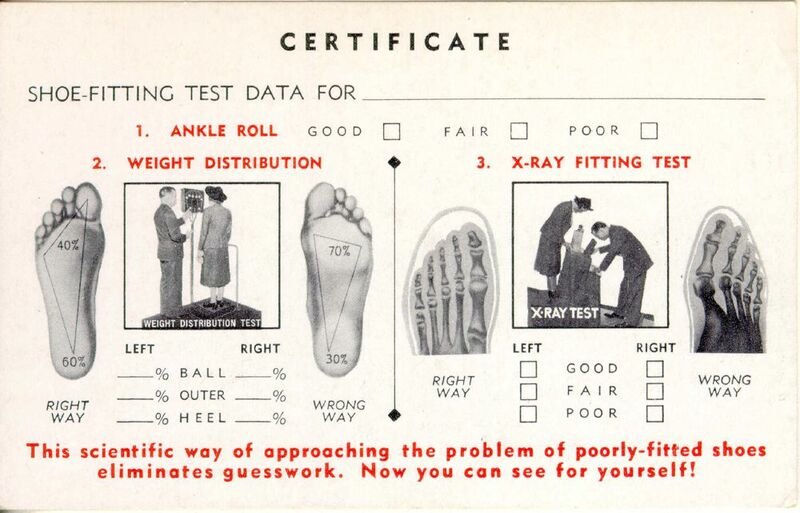 260-282, accessed online at http://www.academia.edu/30926032/Baring_the_Sole_The_Rise_and_Fall_of_the_Shoe-Fitting_Fluoroscope_.pdf on 21 June 2018. Family Shoe Store had two fluoroscopes, McLean’s Shoe Store had one, and the local department store had one, according to Family Shoe Store owner Kevin Thompson. Port Angeles’ population in 1950 was around 11,200, so that’s one fluoroscope for about 2,800 residents. Oak Ridge Associated Universities (ORAU), “Shoe-Fitting Fluoroscope (ca. 1930-1940),” Health Physics Historical Instrumentation Collection, https://www.orau.org/ptp/collection/shoefittingfluor/shoe.htm, accessed 21 June 2018. Duffin, Jacalyn, and Charles R. R. Hayter. “Baring the Sole: The Rise and Fall of the Shoe-Fitting Fluoroscope.” Isis, Vol. 91, No. 2 (June 2000), pp. 260-282. Available online at http://www.academia.edu/30926032/Baring_the_Sole_The_Rise_and_Fall_of_the_Shoe-Fitting_Fluoroscope_.pdf. Retrieved 21 June 2018. Larkins, Karen. “Here’s Looking at You, Kids.” Smithsonian Magazine, July 2003. Article displayed at Family Shoe Store, Port Angeles, Washington. Viewed in-store 6 June, 2018. Text available online at https://www.smithsonianmag.com/science-nature/heres-looking-at-you-kids-85790281/. Oak Ridge Associated Universities (ORAU). “Shoe-Fitting Fluoroscope (ca. 1930-1940).” Health Physics Historical Instrumentation Museum Collection. https://www.orau.org/ptp/collection/shoefittingfluor/shoe.htm. Retrieved 21 June 2018. Thompson, Kevin. Owner, Family Shoe Store, Port Angeles, Washington. Interview by Caroline Ross, 21 June 2018.